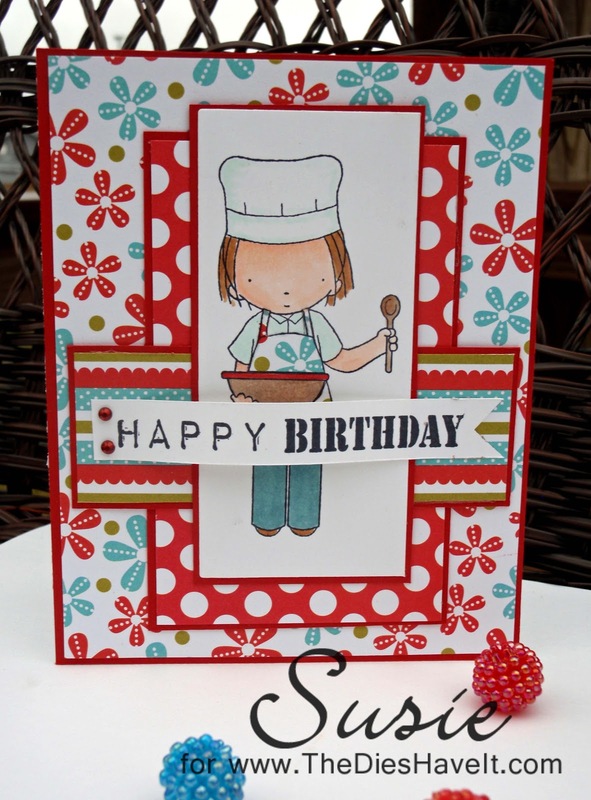 Created 4 Creativity : Happy Birthday! Here is Texas we had some snow which has turned to rain and I am one happy girl not going out in any of it! This card is going in the mail tomorrow (they say it will be in the 70s!). I have quite a few February birthday friends....but this one is going to someone REALLY special to me. I only used one die and that was a Spellbinders long rectangle. I cut all the other pieces by hand. Everything except the little banner was matted in PaperTrey Ink's red cardstock. I can't tell you how many times I reach for that paper. As a matter of fact, I'll be ordering some more this month! I am submitting my card to the Wednesday Stamp Club at MFT Stamps. Here is this week's sketch for you to try too. I'll be back tomorrow with some tags I made for a baby shower this past weekend. Stay tuned. Such an adorable card Susie, I really love the combination of papers.